Sunday Workshop Dates – All held at The Liftoff Yoga Centre at 335 Hein Rd, Buccan, QLD – $69.00 for members, $89.00 for non-members. April 23rd workshop 2 – Your body and what you ingest. Death by diet! July 16th workshop 5 – Ghosts, aliens, apparitions, entities & the like. October 15th workshop 2 – Your body and what you ingest. Death by diet! August 27th workshop 2 – Your body and what you ingest. Death by diet! November 26th workshop 5 – Ghosts, aliens, apparitions, entities & the like. The more we know about ourselves and the nature of reality, the more tools we have to begin to make powerful changes in our lives! The key to change is to understand as much as we can about consciousness and the ‘tools’ it uses to develop its self – namely experience via our emotions and feelings. Our consciousness is very aware and notices everything, it observes and pays attention to us. It is aware of our thoughts, our feelings, our emotions, our dreams, our behaviors, and our desires. It ‘observes’. Your environment does not control your thinking, you do! Once you learn the secrets of tapping into the resources within and the conscious ‘Living Field’ around us, you become very aware of how all effects you and the future you are creating and able to create. Science is now finally demonstrating how sound frequency is the fundamental structure, or organizational principle, of everything in our universe: the way in which matter comes into being. Even the nucleus of every cell of your own body is a quantum sound wave, constantly in dialogue with the field of reality. When you consciously use sound to create your world, remarkable things begin to happen for you. Knowing how to use your mind to create the ‘frequency’ of your desired outcomes however can be tricky, especially when our EGO and program ‘blocks’ gets in the way. When you understand how it all works the world changes as you see the effects of your thoughts coming into being however. What you’ll learn in Streetwise Women Workshop 3. You’ll discover what the CONSCIOUS NETWORK of SYSTEMS is and how we create into ‘BEING’, by what it is we envisage and how we then turn those desires into our physical reality. Be guided through some very funny metaphors to gain an understanding of consciousness, free will and the powers we all have to create balance and harmony [or disharmony] in our body and life as a whole. Why Thinking is a system just like all other body functions. Our Thinking, our Emotions and our Words are connected to a ‘System’. We have body systems, planetary systems, weather systems, solar systems and star systems etc. We are ALL part of ONE HUGE NETWORK OF SYSTEMS. 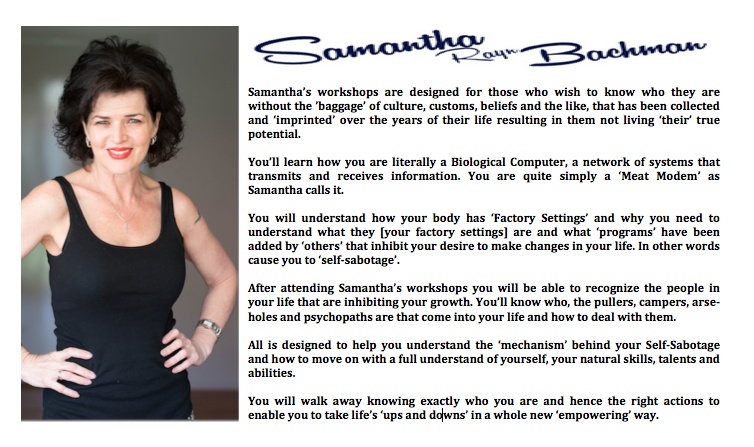 Samantha’s unique entertaining delivery of her profound teachings with have you thinking, pondering and laugh through the whole workshop. These gatherings are for women who wish to know, who they actually are without the baggage that has been collected over the years of their life. To then take that understanding of them selves and transform there lives. Women will learn about themselves, their most suited diet, career path and how to change most things in their lives so as to thrive instead of just surviving their life, as is the case with many. Learn how you are quite simply a Biological Computer, which is a network of systems that transmits and receives information. You will understand how your body has ‘Factory Settings’ and why you need to understand what they are and what ‘programs’ have been added that can inhibit your desire to make changes if you don’t realize they are there. In other words cause you to ‘self-sabotage’. You’ll learn your profile, how to understand your Biorhythms, natural skills and your natural abilities. All are there to help you understand who you actually are, not the labels placed on you over the years, including the labels you have placed on yourself, which just may be the cause of many of your problems. You’ll understand your input data and how your biological systems react to that data, (information). Thoughts are just like food, they can enhance our systems or poison them. You will be able to work through the language you use and enhance it to enable you to ‘correct’ imbalances within your body. You will be able to recognize the people in your life that are inhibiting your growth. Know who are the pullers, campers and psychopaths that come into your life are. You will learn how to bring what it is you desire into being and what you are doing that is pushing your desires away from you. You will leave understanding your EGO and it’s personality traits. You will learn about ‘Self-Sabotage’, which will have you understand the ‘mechanism’ behind your own personal Self-Sabotage. The Streetwise Women Workshops are designed the have you understand yourself fully. You will walk away knowing exactly who you are and hence the right actions to enable you to take life’s ‘ups and downs’ in a whole new ‘empowering’ way.